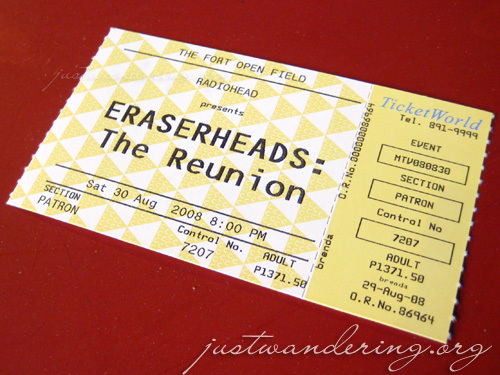 Ladies and gentlemen, it’s confirmed: The Eraserheads concert, “The Final Set” is set. Save the date: March 7, 2009. Venue is to be announced — for now, it’s a tossup between The Fort and SM Mall of Asia grounds, say concert producers MTV and Smart. The Eraserheads are just about to sign the contract and will have their press conference on January 19. That’d be awesome if it would really push through. I remember saying in AJ‘s Q&A right after the Eraserhead’s reunion concert last August that I’m not really interested in watching a part 2 of the concert, if ever they’re going to have another one, but daaamn, now that I read about this, I want to go! errrrr….. nasa CGY ako nyan.. di ba may ticket ka na din? Yuh. And si Karla and Sha din. kaabang abang nga tong concert. mga kaibigan ko excited na.